I’m not really sure how I lived without a Swiffer for so long. Now that I have one, I use it all the time. It replaced my broom and my mop, and picks up my constantly shedding hair like nobody’s business. If you’re on that same train — hesitating to buy a Swiffer because of the cost, or because you have a weird attachment to archaic cleaning supplies — keep reading. The trick: Use a site called TopCashback. Even if you’ve heard of cash-back shopping sites before, this one is different. While other sites only give you a percentage of their commission, this site gives you the entire thing. Which means big payouts for you — bigger, in fact, than any other cash-back site. Just shop online at one of its 4,000 partner retailers, and TopCashback will give a percentage of your spend back to you. There’s no minimum to get paid out, and you can request your money in the form of bank transfers or gift cards. Plus, right now, you’ll get a free Swiffer Sweeper Starter Kit just for signing up. This kit has everything you need to kiss your mop and broom goodbye: one Sweeper, two dry sweeping cloths and one wet mopping cloth. If you shed as much as I do, this is one offer you won’t want to miss. Click here to sign up for your free TopCashback account. Note: This offer is valid for new members only. After signing up, you’ll be redirected to a page that says “Free Swiffer Sweeper Starter Kit.” Click the “Get Cashback” button. Once redirected to the Walmart homepage, add the Swiffer Sweeper Starter Kit to your cart. Make sure it’s the only item in your cart, or you won’t receive proper credit. Check out and pay as normal. Select the “free store pickup” option, so you don’t have to pay for shipping. Swing by your nearest Walmart and get your Swiffer kit from the customer service desk. Within 14 days, you’ll see a credit for $11.97 (plus whatever tax you paid) in your TopCashback account. You can immediately request your cash via Paypal, a bank transfer or an Amazon gift card. This offer runs from now until October 11, 2016. Click here to try TopCashback and get your free Swiffer Sweeper Starter Kit today. 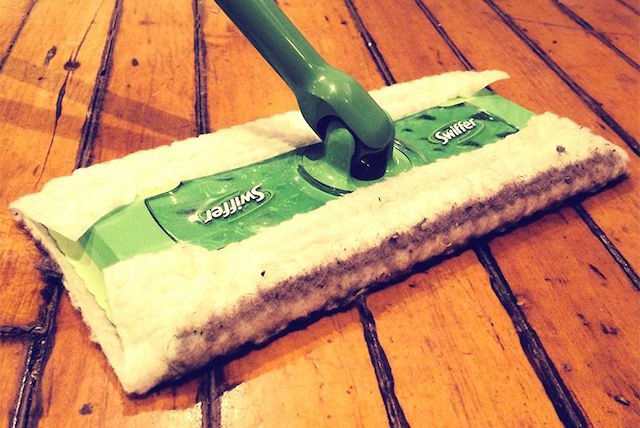 Your Turn: Have you switched to Swiffer yet? Sponsorship Disclosure: A huge thanks to TopCashback for working with us to bring you this content. It’s rare that we have the opportunity to share something so awesome and get paid for it!